A lovingly restored 17th century Cider Barn, a Stable transformed and a secret Walled Garden, all with breath-taking views over the Blackdown Hills and nestled in the heart of the glorious Devon countryside. Upton exudes warmth and charm and offers a stylish yet relaxed setting for an idyllic wedding. Located on the edge of the market town of Cullompton, between Exeter and Taunton, it is easily accessible from the M5. 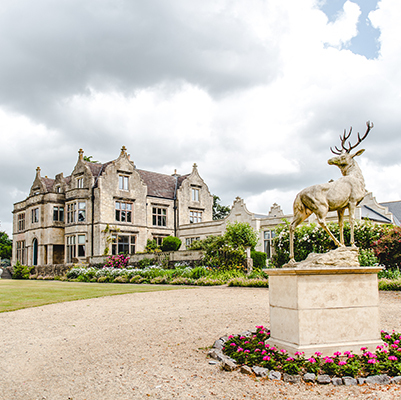 This much-loved family home offers complete exclusivity for weddings of up to 156 guests. The four spaces have all been sympathetically restored and designed to create a unique blend of traditional and contemporary architecture. “Upton was designed for couples looking for a venue where they could relax and feel at home yet still feel like a VIP. We have such wonderful memories of our own wedding day at Upton and hope others will be equally captivated”, say owners of family-run Upton Barn & Walled Garden, Claire & Richard Down. Registered for civil ceremonies, couples can choose to say their vows either beneath the beautifully hand-crafted oak arbour within the Walled Garden or inside The Cider Barn with its romantic lighting, soaring oak trusses, polished concrete floor and floor to ceiling window bringing the outside in. Both provide the perfect spot for wedding ceremonies. Following on from the success of The Cider Barn and Walled Garden, Upton undertook a second project in 2017 to transform a stable barn. Continuing the theme of blending old with new, The Stable Barn is a characterful space with a contemporary twist. The dramatic full height window fills the room with daylight whilst the elegant bespoke chandeliers, wall lights and timber interiors give an added comforting warmth to this versatile space; for a memorable wedding feast. The Press is a chic bar where guests can relax on the soft seating, socialise over a artisanal drink or cosy-up around the wood-burning stove. On warmer days, guests are welcome to enjoy the adjacent Walled Garden or explore the extensive grounds beyond. As evening falls and the gardens light up, guests can relax in The Walled Garden seated under the stars, listening to the crackle of the fire pits or dance the night away in The Cider Barn; a magical end to a special day. Couples may indulge in their own personal choice of suppliers to deliver the stylish and seamless service they require according to their vision and budget. Upton is a “no corkage” wedding venue. Claire, Richard and their team are on-hand throughout to guide and support you as much or as little as you need to ensure you have the wedding of your dreams.